For the School's first 43 years, most CDS parents packed lunches for their children. We dreamed of one day having a proper cafeteria space with a permanent food service provider. That dream has finally come to fruition as the CDS community sits down together in its new state-of-the-art Niczowski, Temovsky, Arrigo Dining Hall. Since the grand opening in fall 2015, daily snacks are delivered to the Junior School, and fresh fruit is available everywhere. On average, the CDS community is now eating 900 pieces of fruit each day. The wax-free fruit, purchased as locally as possible, is thoroughly pre-washed by our provider, and boxed and shipped to us for our eating pleasure. Chef Marcello grew up in Maple and has been familiar with The Country Day School his entire life, having had childhood friends attend for Middle and High School. He has served at the helm of the Niczowski, Temovsky, Arrigo Dining Hall since its opening in September 2015, and leads an incredibly talented staff of Aramark employees who are passionate about the food they prepare for 900 students, faculty and staff every day. The Green Kitchen will tailor to students who follow a vegetarian or vegan diet. All students with allergies or dietary restrictions should visit this station for information about what is available to them on the menu that day. The Comfort Zone will offer home-away-from-home traditional favourites. Create the perfect deli sandwich made by you, just the way you like it. 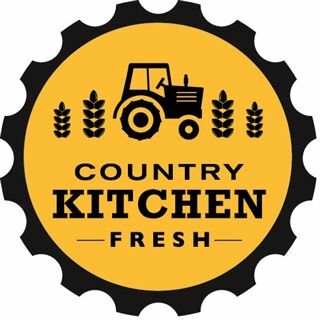 Students will select from a wide assortment of the highest-quality meats, local and imported cheeses, freshly baked rolls and breads, and homemade spreads and condiments. Prepared right in front of your eyes, students will be able to watch flavourful meals be made for them. Students can top any creation with fresh cheeses, herbs and spices. 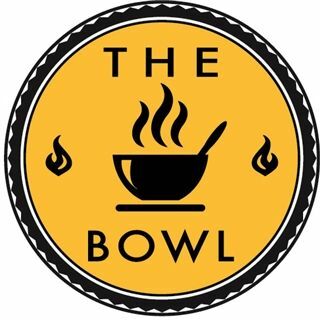 To start, this will be offered twice a week with a variety of tantalizing noodle bowls and rice dishes. We only make soup one way - from scratch - because it tastes better that way! The daily selection will always feature vegetarian/vegan options to meet students' dietary needs. Students can enjoy a real Italian experience with rotating daily specials from pizzas to handhelds to authentic pastas. 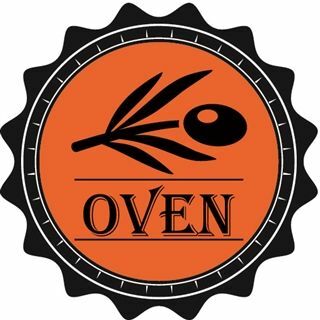 All dough and sauces will be made from scratch and toppings will include fresh local ingredients and spices, when possible. Enjoy a cold, refreshing drink from our healthy beverage station for a fresh and nutritious boost during the day. Each week we will offer a variety of smoothie drinks using a combination of fresh and local fruits and vegetables. Each day we will feature seasonal rotating varieties of lettuce, freshly-cut vegetables - local when possible - and lighter, ethnic-inspired legume and grain salads. House-made dressings and plenty of crunchy toppings will provide students with all the makings for a healthy and personalized salad. With such an emphasis on nutrition and variety, does that mean the Niczowski, Temovsky, Arrigo Dining Hall will strive to offer organic and local foods wherever possible? 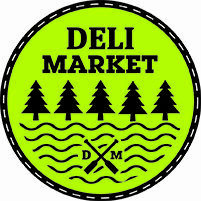 Our new Dining Hall program will reflect CDS’ commitment to sustainability and our kitchen will forge a partnership with the Greenbelt Fund and an organization called 100km Foods Inc., allowing us to make use of local products when seasonably available at a reasonable price. We plan to offer seasonal menus and even grow our own fresh herbs and micro greens, and maybe even a school vegetable garden. How will you ensure that CDS students embrace all of the healthy offerings and not just queue up at the pizza oven every day? Will the kitchen staff be prepared to recalibrate as needed? Admittedly, there will be growing pains in the beginning, but our Aramark kitchen staff are experts at what they do. We will use menu planning to ensure that the choices are laid out in a way that will encourage students to eat a variety of foods. We also won’t have pizza every day! My child is a fussy eater and while all of these different stations and options sound amazing, how can I be sure there will be something he/she will want to eat? Over time we believe students will be exposed to such a variety of food choices that they will acquire a taste for a much broader range of foods. In the short term, we will make use of our seven marché stations to ensure that on any given day, there are a number of more traditional, broadly adopted foods available. In the case of the most difficult eaters, or severe allergies, our chef will meet with families individually to tailor a program that works. My child is only 8 years old, how will they handle the marché style set up? Meals will be delivered to the classroom for students in JK-SK and students in Grades 1-3 will be served “family style” with their teachers in the Dining Hall. Students Grade 4 and older will learn to quickly navigate the new servery with lots of guidance in the beginning. How will the Niczowski, Temovsky, Arrigo Dining Hall accommodate my child's food allergies and/or sensitivities? Will I have an opportunity to speak with the new kitchen staff in advance so that I am comfortable with what the daily offerings will be? A student friendly signage system will alert those with allergies to foods that are a concern. Kitchen staff and CDS staff are also widely aware of students with food allergies and will be proactive in making sure certain foods are avoided. All menus will be available well in advance in easily accessible form, and additionally, staff will meet with those families with allergy concerns. What will happen when my child travels to an off-campus sports game or class field trip during school hours? If your son or daughter is on a CDS field trip or at an away athletic game (with the exception of extended or overnight trips) a healthy boxed lunch will be provided. My children are involved in clubs that meet at lunch. Will there be a place in the Niczowski, Temovsky, Arrigo Dining Hall for students to have "working lunches" with faculty advisors similar to what they are accustomed to? Absolutely. The Dining Hall has plenty of seating and will have a variety of table styles to meet the needs of groups conducting a working lunch, and will also be open for group work/study throughout the day. A great addition to your Thanksgiving dinner (or anytime really...)! 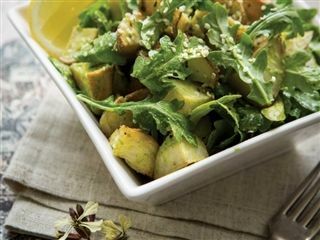 This potato and arugula salad is perfect to serve at your next family meal. 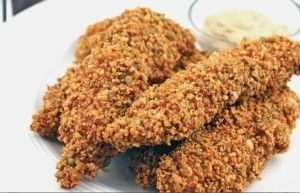 These chicken fingers are a hit with both students AND staff! 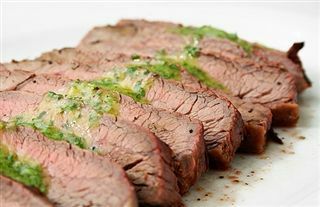 This melt-in-your-mouth marinated steak is delicious, but with an easy, flavorful chimichurri sauce made from fresh herbs. It’s incredible! We value and appreciate receiving your compliments and suggestions. If you have questions, please contact communications@cds.on.ca or (905) 833-1220. Thank you! 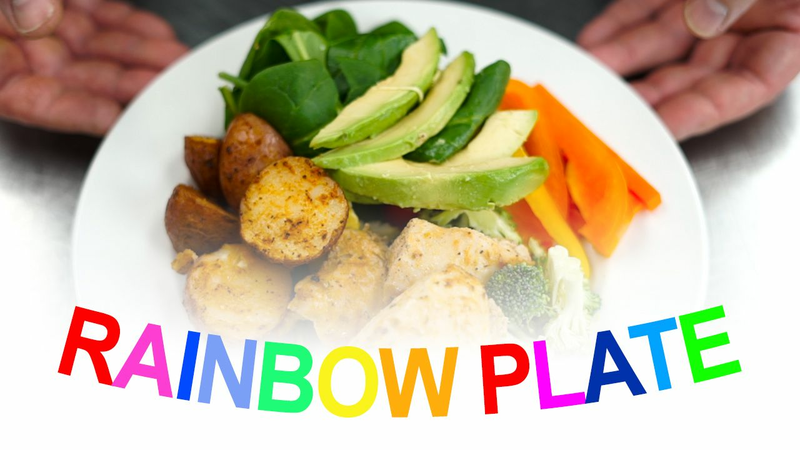 Communicating health, wellness and sustainability information to students is just as important to us as it is to providing wholesome and delicious food. Multimedia LCD screens will be used on a daily basis to provide nutrition information related to a monthly health and wellness theme. At least once a month an interactive Health for Life booth will be held by a nutrition scientist to engage students in current health topics, as well as nutritious food sampling. Students will also get the chance to meet local farmers, food suppliers and artisans, and connect with gues chefs on Local food Days. To Help support our commitment to sustainability and reducing environmental impact, we are excited to bring forward a "farm to market" program with local partnerships with farms, such as the Yorkshire Valley Farms, Pine River Cheese, Carron Farms and Slegers Greenhouses. 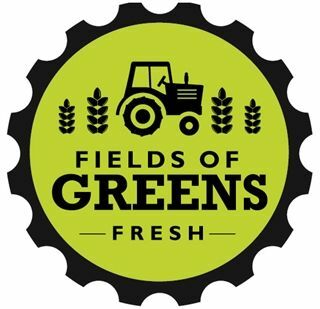 In an effort to expand our opportunities with small to medium size local producers, we are also working in partnership with the Greenbelt Fund on a local 100km Food Hub pilot that provides additional access to local farms. Our seasonal menus - not cycle menus - are a core part of our commitment to sourcing local and keeping things fun, fresh and interesting. Local vegetables and fruit will be clearly identified within our menus and change with the seasons. A continued force on scratch cooking will also guide menu development - including our sauces, salsas, dressing, soups, stocks, pastas, pizzas, desserts and more!